This is the first book-length account of the pioneering and prolific Kellogg family of lithographers, active in Connecticut for over four decades. Daniel Wright Kellogg opened his print shop on Main Street in Hartford five years before Nathaniel Currier went into a similar business in New York and more than twenty-five years before Currier founded his partnership with James M. Ives, yet Daniel and his brothers Elijah and Edmund Kellogg have long been overshadowed by the Currier & Ives printmaking firm. Editor Nancy Finlay has gathered together eight essays that explore the complexity of the relationships between artists, lithographers, and print, map, and book publishers. 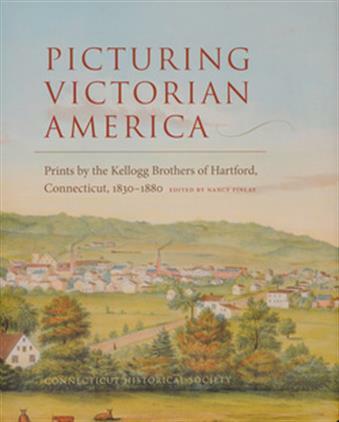 Presenting a complete visual overview of the Kelloggs’ production between 1830 and 1880, Picturing Victorian America also provides museums, libraries, and private collectors with the information needed to document the Kellogg prints in their own collections. The first comprehensive study of the Kellogg prints, this book demands reconsideration of this Connecticut family’s place in the history of American graphic and visual arts. CONTRIBUTORS: Georgia B. Barnhill, Lynne Zacek Bassett, Candice C. Brashears, Nancy Finlay, Elisabeth Hodermarsky, Richard C. Malley, Sally Pierce, Michael Shortell, Kate Steinway.